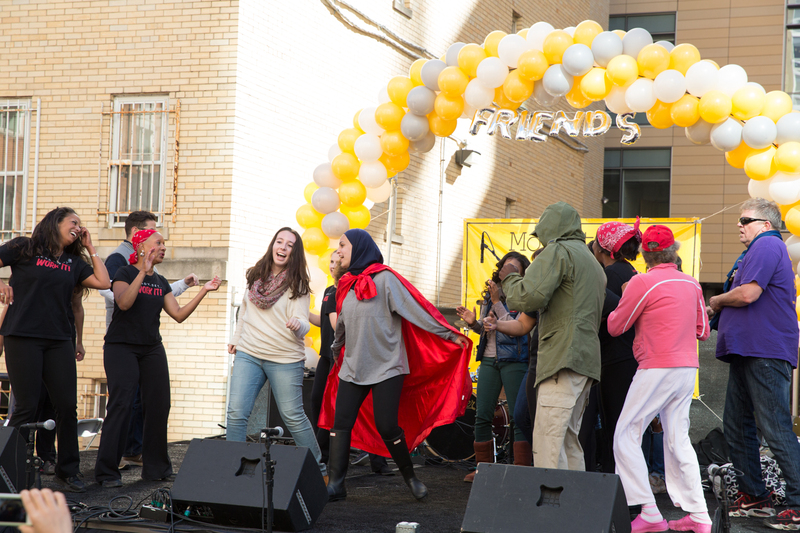 A performance by comedian Seth Meyers, the annual Neighborhood Block Party, Vern Harvest and more unite GW community in celebration of university spirit. Co-ed a cappella group the GW Vibes were one of many student organizations that performed at the 12th annual Foggy Bottom/West End Block Party on Sunday. The bleachers of the Charles E. Smith Center were a sea of buff and blue on Friday evening as more than 2,800 George Washington University students, families and friends united for Colonials Invasion, the annual kickoff event for Colonials Weekend. 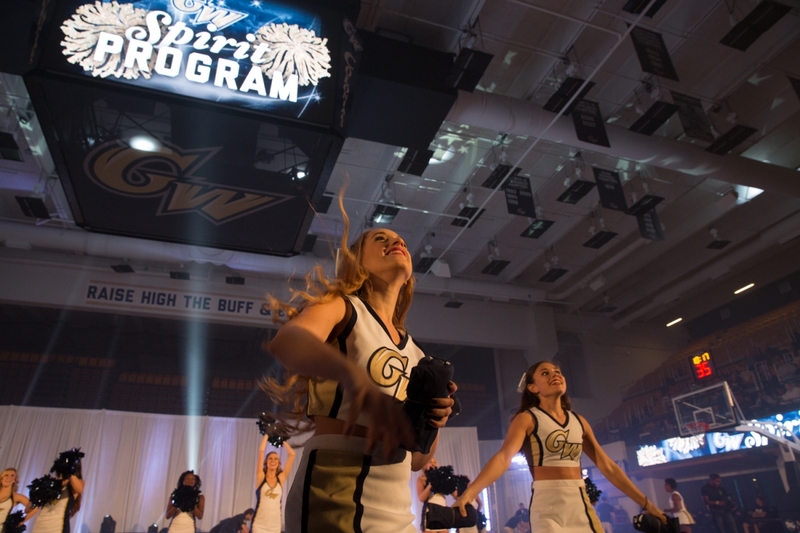 The GW Athletics-sponsored event marked the start of the 2014-15 basketball season, which holds much promise for the men’s and women’s basketball teams. Following a standout performance in 2013-14, the men’s team earned a third-place finish in the Atlantic 10 Conference and is picked to finish second in the conference this year. Accompanied by soccer player Jonny Forrest, basketball player Joe McDonald, water polo player Brian Mojica and rower Jordan Volpe, Dr. Knapp opened the event by speaking about the university's involvement in the White House's "It's On Us" campaign. He showed a public service announcement produced as part of the university's efforts that features student-athletes. As the video finished, he commended student-athletes for their leadership on and off the field. George Washington University students, faculty, parents and friends gathered to Raise High at the Charles E. Smith Center on Friday evening for Colonials Invasion. The GW Cheer and First Ladies Dance teams were among the many student organizations that performed. “Raise High!” rang through the air as the audience sang the “GW Fight Song” accompanied by the GW Band before applauding performances by student teams and organizations including the GW Cheer and First Ladies Dance teams, the GW gymnastics team, the Voice Gospel Choir, GW Bhangra, Capital Funk and more. The high-energy spirit rally was an appropriate start to the jam-packed weekend of events that included lectures by notable professors at “Classes from GW’s Best,” a visit to the Mount Vernon Estate and the Office of Parent Services annual silent auction. Other highlights included the world premiere of faculty-led performance piece “Vanishing Point” and the dedication of Tucker Field at Barcroft Park, which recognized Board of Trustees member Ave Tucker, B.B.A. ’77, for his $2 million donation to GW athletics and academics. Saturday, the first full day of Colonials Weekend events, began with the Dean’s Breakfasts, where deans and faculty from GW’s five undergraduate schools met with students and parents to discuss how students are preparing for success during and beyond their college experience. Following the breakfasts, Provost Steven Lerman addressed parents and families at the Colonials Weekend welcome ceremony, which included remarks from Student Association President Nick Gumas and a panel discussion with leading politicos moderated by School of Media and Public Affairs Director Frank Sesno. 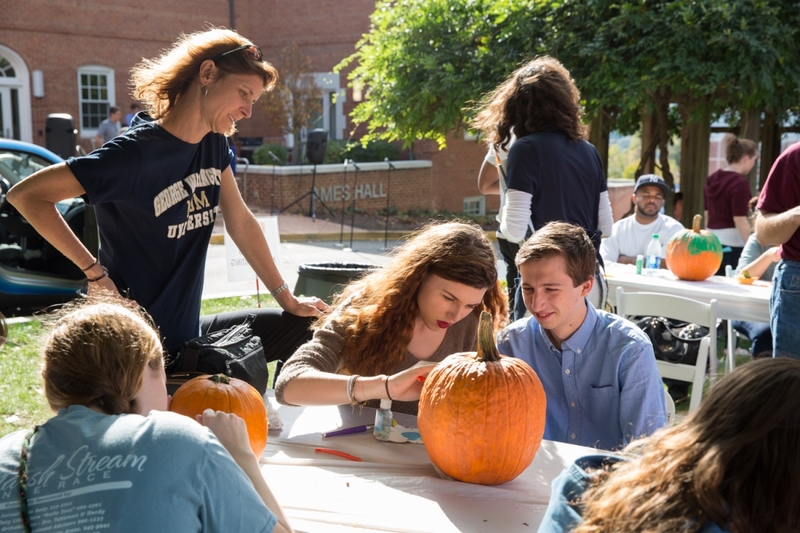 In the afternoon, students and parents took part in the Vern Harvest, a university tradition held at the Mount Vernon Campus that featured face painting, pumpkin carving and other fall-inspired activities. 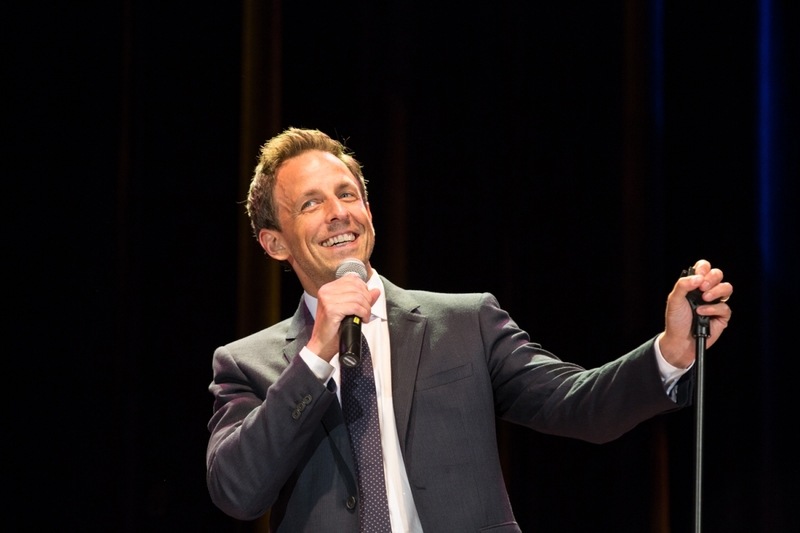 A headlining performance by Seth Meyers, former head writer for “Saturday Night Live” (SNL) and current host of “Late Night,” topped off Saturday’s events. 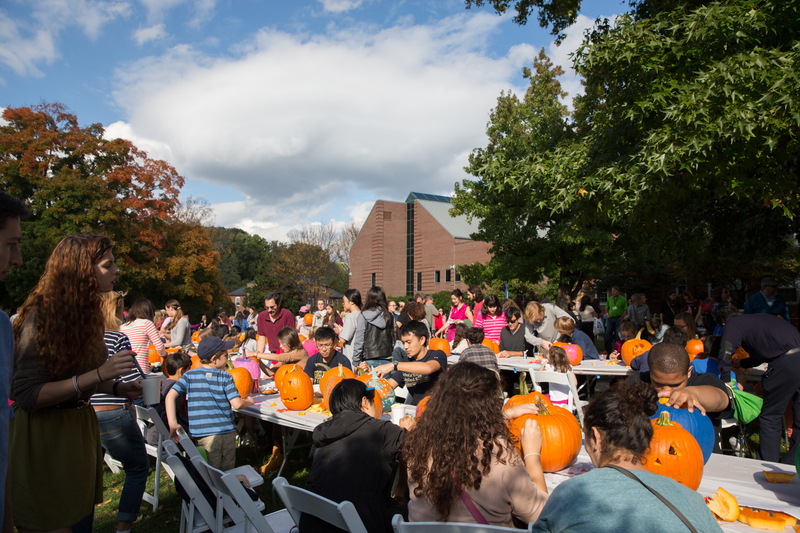 Formerly known as Octoberfest, the Vern Harvest brought students, families and friends to the scenic Mount Vernon Campus for an afternoon of autumn activities such as pumpkin carving. Looking at ease in his signature suit and tie, the boyish-looking comedian touched on the separate threats posed by the terrorist organization Isis and Ebola, the political stalemate between the Republican and Democratic parties and the difficulty of being president during a second term. He joked that not even a “gun hurricane” could get politically divided Americans to agree on gun policy and climate change. “I love being in Washington, D.C. You can just feel the energy of things not getting done,” he deadpanned. 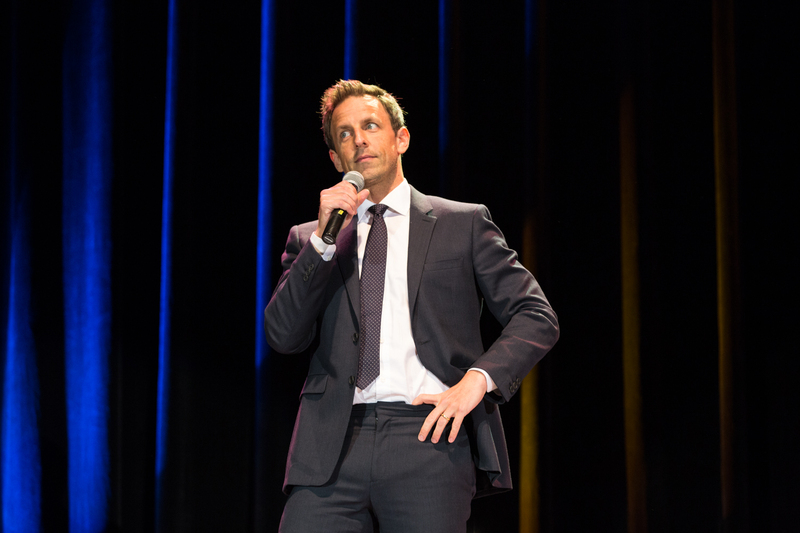 Seth Meyers' headlining performance on Saturday evening cast current events and everyday situations in a comedic light. The weekend rounded out on Sunday with the 12th Annual Foggy Bottom/West End Neighborhood Block Party hosted by the GW Office of Government and Community Relations. 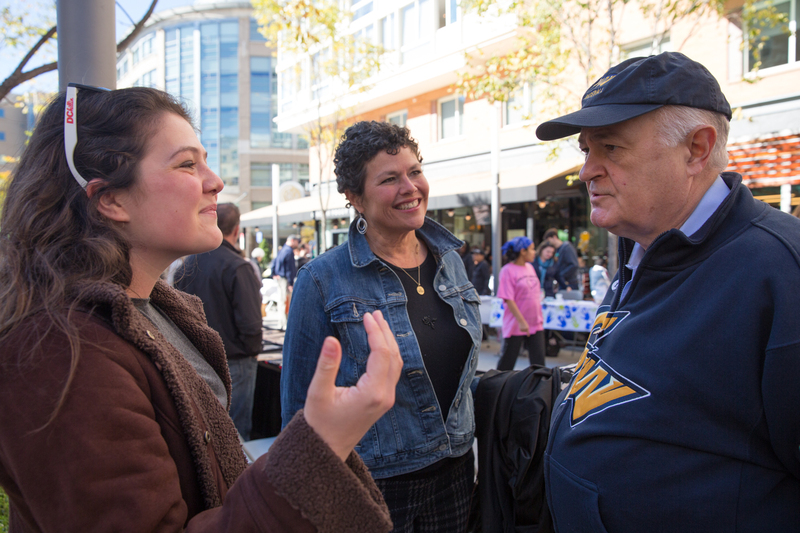 Foggy Bottom and West End residents, the university community and more than 100 local businesses, student organizations and university departments set up camp on I Street Northwest for an afternoon of food, conversation, giveaways and performances. The festivities ended with a performance by the Tim Miller Band led by Associate Dean of Students Tim Miller. Dr. Knapp told the crowd that he is proud the university is a part of such a dynamic community. He added that as the co-chair of the Age-Friendly Task Force, he, the faculty and community partners would continue to work to make D.C. more responsive to seniors. 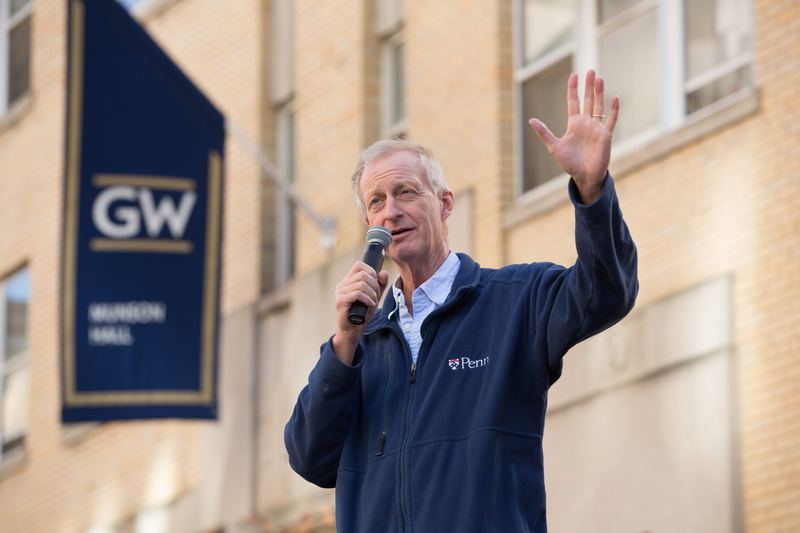 Ward 2 Councilmember Jack Evans (D), a 23-year career politician, also gave remarks, congratulating Dr. Knapp on the progress the university has made under his direction during the past seven years. 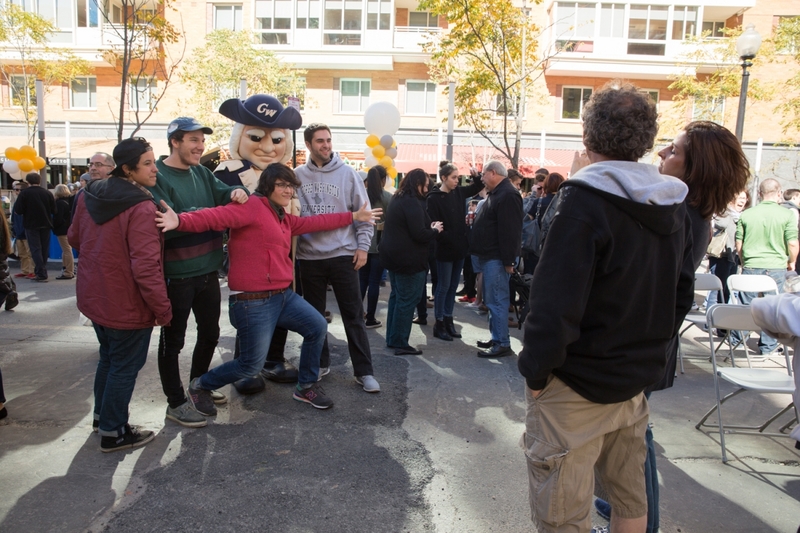 Big George posed with students at the Foggy Bottom/West End Block Party on Sunday. The afternoon of food and fun highlighted GW's strong connection to the community. D.C. resident Curly Edwards attended the block party with her husband to support her daughter Leah Edwards, a senior. The Columbian College of Arts and Sciences and SMPA student co-directed “Doing it for Me,” a documentary about the high-school dropout problem that recently premiered at West End Cinema. As the block party came to a close, Elliott School of International Affairs sophomore Claire August reflected on how Colonials Weekend was an opportunity to not only explore activities on campus, but also to show her parents how GW’s unique location in the nation’s capital informs her college experience. 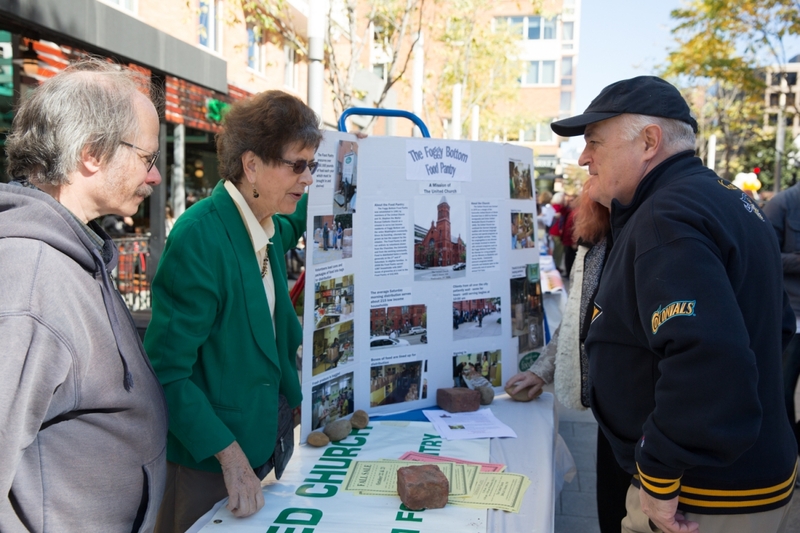 George Washington President Steven Knapp visited community members at the block party. During a speech, he told the audience that he is committed to making D.C. more "age-friendly." She added that in addition to having a great time, the weekend provided much-needed quality time with her family. “They come every year, and I moved onto campus early this year, so it was really great to see my parents,” she said. 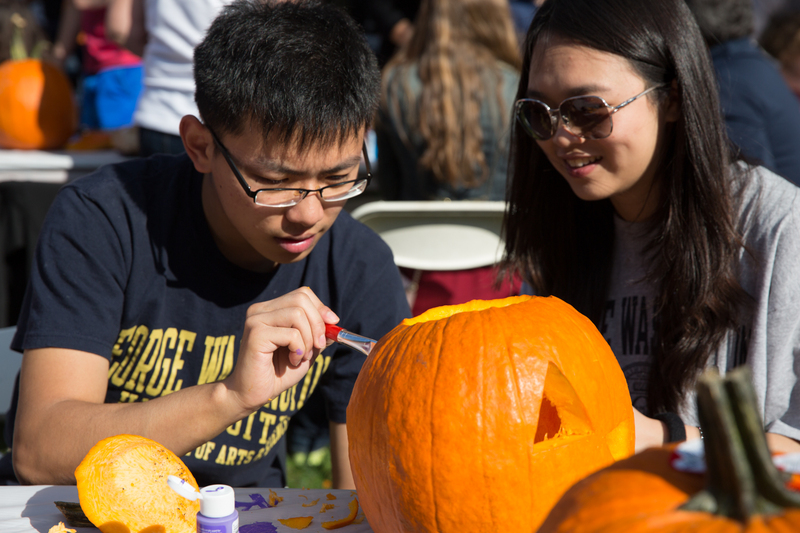 The fall affair featured pumpkin carving and other fall treats. 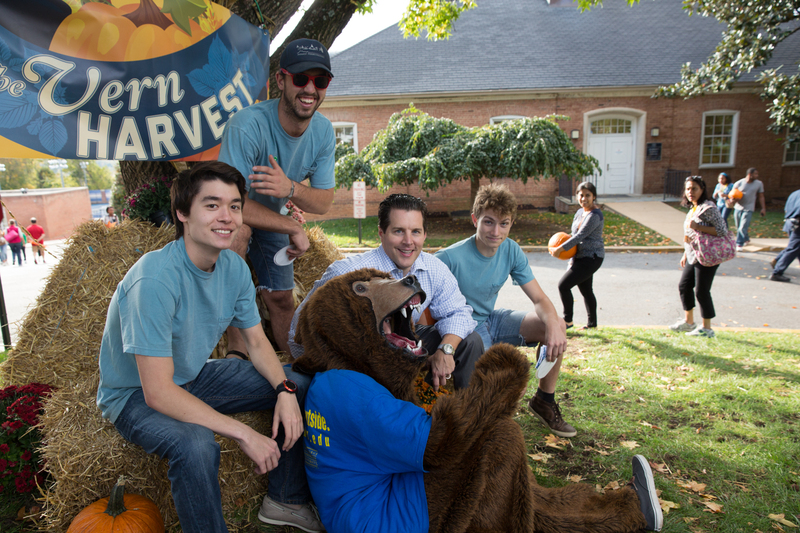 Students sit with Vice Provost and Dean of Student Affairs Peter Konwerski at Vern Harvest. During a headlining performance, Seth Meyers' quips ranged from tales of burying his brothers pet rabbit Petey to the George W. Bush presidency. The crowd took to the stage to dance at the Foggy Bottom/West End Neighborhood Block Party on Sunday. D.C. Councilmember Jack Evans said that he has been working in D.C. since the city was struggling. Pointing to the retail and residential areas around him, he marveled at how far the city has come. George Washington President Knapp spoke with students and parents at the block party. 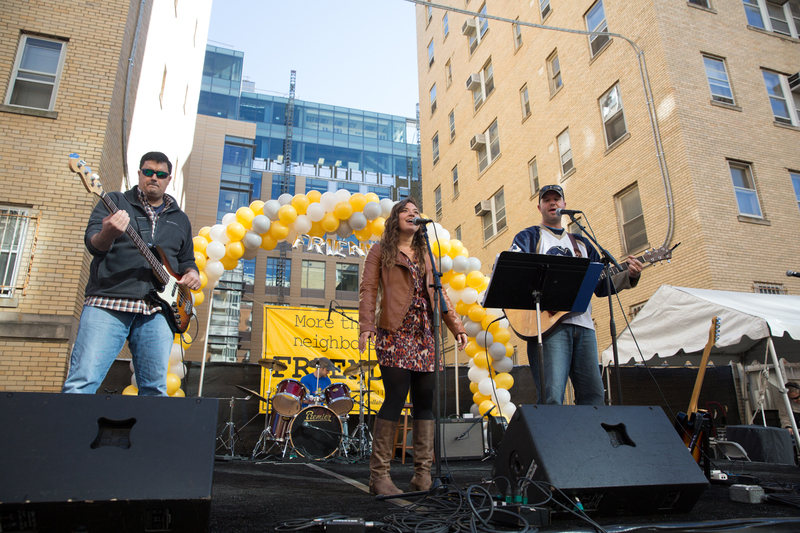 Associate Dean of Students Tim Miller made a headlining performance at the block party with his band the Tim Miller Band.